Under a cloudless blue sky on a fresh November morning the first competitors arrived early to Tyneside Vagabonds' first ever CXNE event, and first cyclocross promotion in many years. The venue of Thorneyford Farm provided an unusual variation of course and facilities to those usually experienced by CXNE followers at locations like public parks, country parks or schools. The course, set in a single field had two levels of relief connected by steep banking giving the effect of a valley top and bottom, sloping down to the swollen River Blyth. The course design had ensured a mix of rolling straights to test the heart and lungs, hairpin corners, switchbacks and off-camber descents to test technical prowess and a steep incline to run up followed by a more gradual ascent to the valley top to examine the brute strength of the competitors. Luckily, the field benefited from excellent natural drainage meaning that, if anything, it ran faster in most places as the day wore on and clear racing lines were established. The openness of the terrain provided spectators with unparalleled views of the action, particularly from the pit area, from where the majority of the course could be seen. The main event was the Senior Open. 36 took to the start line, but it was Blackhawk Bikes rider Darren Binks who was the first to grab the bull by the horns, getting off to a flyer with Scott Bikes UK rider Keith Murray paying close attention. The chasing riders brought them back to the fold just before the first ascent of the Kirkleyberg where Derwentside’s Tony Glover was the only rider to make a clean attempt on the obstacle, all others forced to dismount and run. This gave Glover a clear gap which he carried over the line to complete the first lap. Steven Ward of MTS Cyclesport was unperturbed, and set about clawing back Glover’s advantage, finally wresting the initiative from him on the second pass of the line. Ward didn’t look back and relentlessly built his lead lap upon lap, finally claiming victory after 10 laps and nearly 55 minutes of racing, clear in first over a minute up on the second placed rider. If Ward’s win was a dominant one, the battle for second was a race long ding-dong between Blackhawk Bikes’ Colin Ash, and TEF Richardson RT’s Mike Thompson. The two, neck and neck for most of the race had passed the eventual fourth-placed Glover, before Ash put in a big dig on the eighth lap to distance his young adversary. Ash extended his advantage in the final two laps to take second by 20 seconds from Thompson, who was the first placed Under-23 rider. Behind the first three there were battles for position throughout the field. During the race, many of the expectant crowd had gravitated with a sadistic magnetism to the cruelly placed run-up; expectant, that was, of struggle and failure to ride the beast. Most of the field gave them their blood, that is, apart from the RAF’s Ian Lee who delighted the onlookers with metronomic regularity as he crested the berg clipped-in and saddled-up lap after lap in an entertaining display that combined strength, panache and technical mastery. In the promoting club’s colours, youngster Adam Hogarth cranked his way to a season’s best CXNE ride of 16th place. 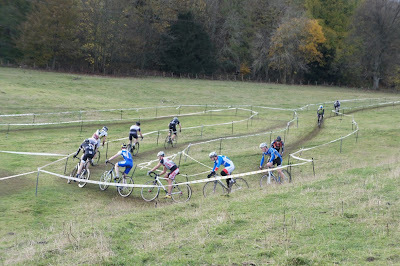 Earlier in the day, the Vets, Women and Junior race had been run off with a CXNE season’s biggest field of 67 racers, following an impeccably observed two-minute silence on Armistice Day. Veteran Keith Ashbridge of VC Cumbria and Juniors James Edmond (Ferryhill Wheelers) and Luke Parkin (Hetton Hawks) were fastest from the gun with Derwentside Junior Steven Lee not far behind. Parkin’s challenge for the win faded as Ashbridge and Edmond pulled out a gap, and Ashbridge’s endurance came to the fore as he distanced Edmond with two and a half laps remaining. Meanwhile, Derwentside veteran John Mein, initially under the radar, rode a well-paced race to take third overall from under Parkin’s nose with just over a lap to go. Ashbridge, Mein and MTS Cyclesport’s Steven Brazier completed the veteran podium while Edmond, Parkin and Lee prevailed in the Juniors. Infinity Cycles’ quickly improving cross rider Bev Blakeman took the women’s prize by a nose from Beacon Wheelers’ Nicola Davies with Karen Robertson of One Life Tri in third. Chris Heppell in 35th place led home a gaggle of Vagabonds with Graeme Gow, Jason Ratcliffe, Rob Hogarth, Kyle Watts, Russ Hughes, Roger Clarke, Anna Turvey and Danny Winthorpe following him across the line. The Youth race saw a battle of attrition between Hetton Hawks’ U16 Matthew Worton and U14 Mark Donovan of Beacon Wheelers. Worton held the early advantage, but was passed by Donovan after three laps only to shadow Donovan into the final lap before launching an attack that saw him take victory by six seconds. The overall podium was completed by Thomas Mein of MTS Cyclesport, just over a minute back. Connie Hurton of Beacons Wheelers was best girl. Hamish Turnbull was quickest Vag, exactly a lap down on the winner, while Josh Craven and cyclocross debutant Jess Watts also acquitted themselves well. A season's biggest field of 40 U12’s took to an abridged version of the full course staying on the high part of the valley to avoid the climbs. Matti Egglestone of Beacon Wheelers took the win followed in on the same number of laps by Ben Dowson of Hetton Hawks and the unattached Oliver Drafton. Fiona Turnbull of the Vagabonds was the fastest girl, and was followed in by fellow Vags Daniel Holmes, Joe Tubby, and under-8 riders Joseph Case, Eve Collins, Phoebe Clark and Sam Holmes. Thanks to all club members who turned out to help, ride, and support, all at Thorneyford Farm for the land/facilities and great food, and CXNE. Video courtesy of Quentin Field-Boden, photos courtesy of Mark Mather.